Fox Grove, the new addition to the Ascot family. The community is centrally located just 15 minutes from Southern Pines and under 20 minutes to Pinehurst. Close to shopping and outdoor recreation and part of a great school district. The development offers 4 lovely home plans; the Bristol, Cornwall, Devon and the Essex. All affordably priced from the high $200’s to the low-$300’s. These spacious and welcoming floor plans will offer the visibly superior look seen in all Ascot homes. They will have their own character but share the distinctive look of Ascot. The community is also a very short commute to Ft. Bragg, Camp Mackall and Pope AF base. Intensives for Phase 1 buyers. Don’t miss out and contact us today! 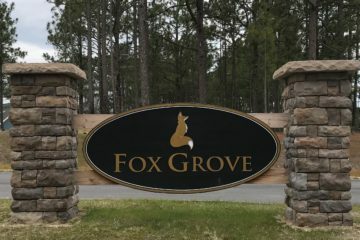 We are sure you will love what it has to offer and want to be a part of Fox Grove. Please visit our floor plans and contact our agent as soon as you find one that suits your family needs. Coming from Carthage, head south on Niagara-Carthage Road, make a left onto Farm Life School Road then at about .8 miles make a right onto Bibey Road. Travel about half a mile and once you pass Farmhouse Lane, Fox Grove will be on the right side. Coming from Whispering Pines, head north on Niagara-Carthage Road then make a right onto Bibey Road. At about .9 miles, Fox Grove will be to your left. If you reach Farmhouse Lane, you have traveled too far.